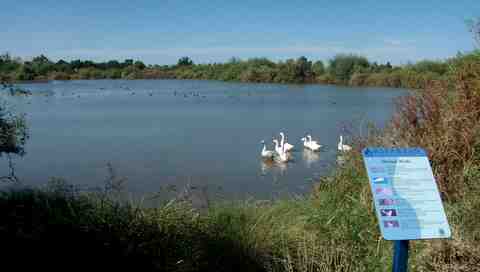 The Gilbert Riparian Preserve is a very interesting preserve that you can walk through. There are gravel walkways that meander next to ponds where migrating birds feed and rest. See the green living fences between you and the birds in the water. Think of a zoo without cages. Then you can get really close and view many species of wildlife. It's educational too, if you wonder what to see, there are signs everywhere. The Water Ranch has a series of ponds that attract shore birds like the Sand Piper and water birds like the duck. Even geese can be found. You can walk through trails in this 110 acre resource and see for yourself. View the movie below and turn up the volume so you can get an idea of the chattering sounds of the birds. We were surprised to even see some horse riders going through the trails! There are more interesting features too, like a stream by the observatory and a floating boardwalk near the Southeast Regional Library on the NW corner of the property. If you like to picnic, there are lots of nice grassy areas and a couple of ramadas with grills that you can reserve and rent. Check out a simulated archaeological site that the kids can play in. It’s near the parking lot and has adobe bricks that make up a low wall that keeps in the sand for the kids with shade overhead. There are some experimental gardens by the observatory that have exhibits of flowers that are best for attracting things like butterflies, bees, and hummingbirds. 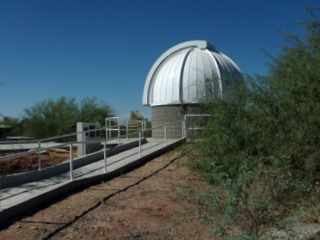 There is a good sized telescope that is housed inside the observatory. It is open to the public a couple of evenings when viewing permits. 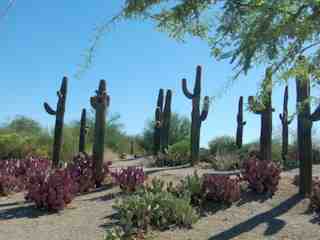 It is on the grounds of the Gilbert Riparian Institute Preserve not far from the parking lot. The site is north of the ponds and is well lit at night so you can find your way. Oh yes, the restrooms are still open at night, at least the time we visited. You can view something interesting on Friday and Saturday after the sun goes down. Hours change due to the seasons, so in the summer the hours start later than in the winter. If there is good clear weather you will be in luck. You walk up the ramp to the observatory and wait in a very short line. There were some cool exhibits outside that were playing on a computer screen while you wait. Once inside, there is room for maybe 10 to 20 people and some amateur astronomers. The astronomers can answer your questions and help you understand what you are seeing. They had a giant 16 inch Meade Telescope last time we were there. You can look through the telescope too! We got to see the moon in all its glorious detail! You will be amazed at how bright and crystal clear the views are. Once your eyes get used to looking through the lens the universe opens up. Do you like to camp? The preserve has programs for youths and scouts. Camping is a great way to appreciate this beautiful site with your group. You can camp here in the middle of civilization and enjoy a campfire under the stars. They have restrooms too. Where is the Gilbert Riparian Preserve? If you want directions to the park just click on the "View Larger Map" then click on the red flag, then click on the "Get Directions" link on the map balloon.